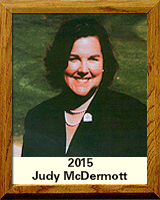 Judy McDermott is a twenty-nine year veteran of professional golf event management with corresponding executive level expertise in the fields of nonprofit agency management. She is the executive director of the Tucson Conquistadores, Inc., the nonprofit civic group known for supporting youth athletes and athletic programs through professional golf since 1962. In addition to her professional golf tournament activities, McDermott serves as executive director of the Tucson Conquistadores Foundation and the First Tee of Tucson. The First Tee of Tucson teaches at risk youth life skills through the game of golf. Over $29 Million has been raised for charity through the Tucson Conquistadores programs. This year, McDermott helped the Conquistadores successfully launch the Tucson Conquistadores Classic, a PGA Tour Championship – Accenture Match play Championship for an eight-year run enriched the Tucson region’s business community and charitable giving throughout Southern Arizona. As important as this success was to McDermott, her dream to develop a Tucson Chapter of the National First Tee Program became a reality in the fall of 2006. A partnership with key public and private entities helped establish the First Tee of Tucson at El Rio Municipal Golf Course. McDermott holds a B.A. from UCLA where she also was a member of the women’s golf team. After graduation, she was tournament coordinator for LPGA tournaments in Los Angeles and Orange County. The California native then moved to Tucson in 1992 to accept the position of marketing director for Tucson’s PGA Tour Tournament operated by the Tucson Conquistadors. She became the tournament director/executive director in 1994, one of only two women tournament directors on the PGA Tour at the time. McDermott’s selflessness and passion to help kids gain self-confidence and experience a better life through sports has supported the growth and value of the Tucson Conquistadores to the community.